Thai posters are friggin' sweet. That is all. For $16.99, I found myself unable to stop myself from purchasing AnimEigo's LONE WOLF AND CUB/子連れ狼 Blu-ray set, which retails for $60 but can usually be had for about $45. As I've covered in the past, the set has a pretty severe DVNR problem, particularly when put side-by-side with its substantially less filtered English dubbed equivalent, SHOGUN ASSASSINS. I'll not belabor the point any more than I need to, what with Ian Jane having done a fine job of showcasing how drastically different the two look, so I'll just talk about the subtitled release now that I've actually had a chance to start watching it. This discussion is for the first film on the set, though having taken a brief look at the later films I think it's safe to say that they're all roughly on the same level of quality. I'll give AnimEigo whatever credit they're due; despite my dull, unsurprised disappointment with the overall image quality, things could have gone worse. Tight close-ups show a decent level of detail, and the intricate patterns on clothing tend to be surprisingly sharp, even on medium shots. A lot of the "softness" on display has more to do with the original focus than anything else, with Tohoscope being a legitimate 4-perf 35mm format that lends itself to a fairly shallow depth of field. Flesh tones look natural, and while I get the distinct impression that the contrast has been somewhat exaggerated, both the crisp whites and deep blacks are as solid as anyone could ever ask for. I don't totally agree with them, but at least now I "get" why so many disc critics have been impressed, particularly with the washed out, hazy nature of so many Japanese HD transfers kicking around: When compared to, say, Toei/Arrow Video's Lady Snowblood, or Toho/Media Blasters's Destroy All Monsters BD (assuming you can ever get your hands on it), there are some really positive qualities to be found here. Unfortunately, DVNR has left the entire collection looking... off. I'll give credit where it's due, they've used a quality algorithm that's not left any obvious temporal smearing, but the total lack of anything resembling organic dithering or celluloid motion on the film's long, still shots baiting the audience with the promise of bloodshed is disconcerting, at best. On fast motion you can occasionally see grain sticking to the edges of moving objects, which becomes particularly obnoxious during the frantically shot battle sequences in which the flailing villains will suddenly be doused in an aura of grittiness against a smooth, serene background. Robert Woodhead, CEO and one of the founding members of AnimEigo, argues that the scanning process they used meant that there's no real "grain" on their HD masters, only video noise; while I can, on a purely technical level, see some validity to this argument, I respectfully, and whole heartedly disagree that smoothing the coarse, noisy "stuff" - whatever it might technically be - has resulted in an improved experience. The 35mm elements AnimEigo used are, at times, littered with minor specs and scratches. Normally I'd not begrudge 35mm film for actually looking like film, but when I see "sparkle" and no grain, my brain has a minor short and makes my heart skip a beat. Another oddity is a strange pulse pattern overlaid on darker colors, and what appears to be chroma that doesn't quite "match up" to the Luma beneath it. It's reminiscent of those ugly, aliased reds you see on DV material, I guess, and I have little doubt this error was on the masters to start with - HDCAM has colorspace issues, but that alone wouldn't explain what on earth we're seeing. They did something to these masters at the hardware level, and the results are... mediocre, at best. High end audio hiss has been filtered pretty heavily, to the point where shouts of vengeance and clashing swords have a slightly distorted, mechanical sound I can't imagine was ever a part of the original mix. Long stretches of silence really are dead silent, to the point where I had wondered if I had somehow accidentally hit the mute button. I never expect much from vintage mono audio materials, particularly not from countries like Japan and Italy which freely mixed on-set audio and obvious ADR loops, but much like the video I can't help but feel that AnimEigo's well meaning digital wizardry has only made less than ideal materials worse, instead of better. The only thing I CAN'T complain about are the subtitles, which include relevant translation notes and change color for two different characters speaking at the same time. Honestly, if there's one thing AnimEigo always rocked out, it was their subtitles, and despite these being a re-purposed version of their 2004 DVD set translation that hasn't changed one bit. Honestly, anyone watching Kozure Okami in HD is probably expecting them to look and sound like a set of 40 year old grindhouse films, so why they went out of their way to futz up what was (admittedly) an already middling set of HD masters, I'll never know. I'm sure a fresh scan of the negatives could yield dramatically improved results, but if you love these movies and English is the only Anglo-themed language you speak, this might be the only game in town for the next several years. On the other end of the Japanese Vintage Genre Blu-ray spectrum, I also watched the first DAIMAJIN/大魔神 film courtesy of Mill Creek. It's a two-disc set for a slim 240 minutes of content, with a BD-50 containing two films and a BD-25 with one, roughly 90 minutes of behind-the-scenes content, and original trailers. It also retails for a meager $25, but can be had for about $11 on a pretty regular basis. It's also worth noting that not only did they include the vintage AIP dubs for the first two films, but they actually created a dub for the third... not sure who'd actually, like, want a new dub for a 60s Kaijuu movie, but the fact that they'd spend the money and go all out on a release they're only going to sell for $5-7 wholesale is the sort of insane, borderline financial suicide you just don't see much of these days. As for the transfer, it looks... fine, really, if not perfect. This is essentially a port of the Japanese Blu-ray Trilogy which clocks in at a hefty $130 MSRP, limited edition or no. As is typical of vintage Japanese features the black levels are somewhat elevated, though it's nowhere near as obvious as, say, the previously mentioned Destroy all Monsters and Lady Snowblood. I don't have a clue if these were pulled from the negatives or a similarly high quality 35mm source, but having been shot on an 8-perf 35mm format, the film looks crisper than the typical giant monster movie from nearly 50 years ago... not jarringly so, sadly, but better by enough that I'm regularly surprised at how much close-up detail there is on what looks like s a relatively low-budget fantasy film. I am disappointed to say that it's clearly another CRT sourced scan, likely from Tokyo Film Lab, but the fuzzy, mechanical looking noise (particularly on darker scenes) is less prevalent than it has been on plenty of other TFL transfers, and honestly, I'd rather have the CRT scan noise on Daimajin than the baby soft waxiness of Lone Wolf and Cub. Turning the contrast up and black levels down on your display would "fix" most of what's wrong with this transfer, though of course consumers should never have to do that of their own accord. 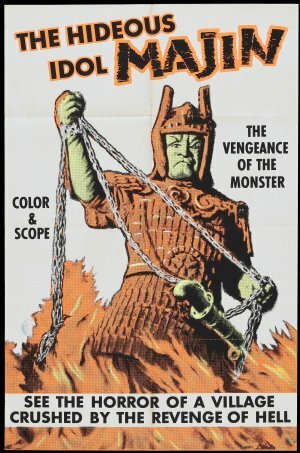 Audio on the Japanese track has an obvious, audible hiss from start to finish, but again, it's a monster movie from 1966. Comes with the territory. The AIP English dub sounds much less harsh by comparison, but never having seen Daimajin on dubbed TV as a kid, I felt no strong desire for that to be the way to watch it on BD. Subtitles are generally adequate, probably a 1:1 copy of ADV's DVD track from a decade ago, though some of the fast-talking bits are oversimplified, and the way they handle "Kami-sama" always feels a little... weird. (A common complaint I have with Japanese entertainment in general, but alas, a discussion for another day.) They're good enough, just not nearly as nice as AnimEigo's efforts. So, there we have it. One digitally manipulated standard release, one largely unmolested budget release. 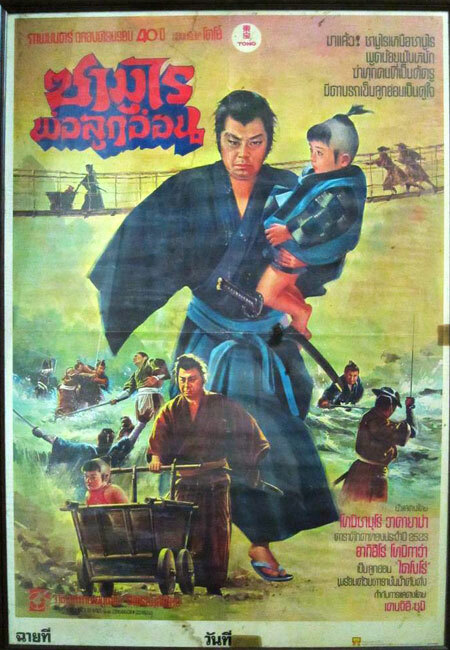 Both of these franchises are great in their own disparate ways; Lone Wolf and Cub is an exciting, pulp riddled action extravaganza that starts on a positive note and just goes crazy from there, and Daimajin is a respectable samurai drama with a huge, supernatural twist that's more than worth the wait. If I had to recommend one, I'd say that Mill Creek's Daimajin Trilogy is just too damn good a bargain NOT to own, but a big part of me thinks that if you're the kind of person who needs Lone Wolf and Cub series in HD, you probably need the AnimEigo set, warts and all. Alternately, I suppose you can just buy the stand alone Shogun Assassins disc - the re-edited English dubbed "remix" of the first two Lone Wolf tales, complete with interviews with Samuel L. Jackson for no sane reason I can think of - which has largely been left unmolested by digital shenanigans. Were I more insane I'd probably sync the Japanese audio and English subtitles to the Shogun Assassins "Sequel" disc and create my own better-but-not-perfect release of the four latter films... but goddamn it, I'm tired of buying multiple copies of the same movie just so I can fix them. If anything, I'd rather wait for France or Japan to create their own superior HD masters and then just subtitle those, instead. Also, seriously guys, check this crap out. It came out in 2010, completely flew under my "WTF Japan?!" radar, and I honestly can't tell if it's a good thing or not. Yes, that's a Daimajin puppet introducing the 26 episode TV series Daimajin Kanon, which is actually a thing, no joke. In short, Japan made a totally unironic Moe Daimajin Puppet Show. Yeah, that's only part of it, but with how dark and bleak the 60s films were, that's just... weird. I wonder how long it'll be before we get an officially sanctioned Grave of the Fireflies 4-panel gag manga? Finally got my LW&C blu-ray set from Amazon (at the crazy low price) and watched the first movie the other night. Looked WAY better than I expected (especially after seeing all the screencaps and reviews). Definitive? No. Watchable? Yes. I gotta say, I will be paying even less attention to reviews/screencaps after seeing this one for myself. Also got the Daimajin set, but haven't had a chance to watch it yet.